If you are struggling to overcome your debt, then Chapter 7 bankruptcy may be right for you. Now is the time to act. With the help of a bankruptcy lawyer from Allmand Law Firm, PLLC, you can work toward the fresh start you deserve. As the largest bankruptcy filing firm in the state, we have already helped thousands of individuals seek relief from their debt. Now, we are ready to help you. Contact our skilled Chapter 7 bankruptcy lawyers to find out how we can help you in your specific situation. Call today at 214-884-4020. When most people think about bankruptcy, they are probably thinking about Chapter 7 bankruptcy. Also called “straight bankruptcy” or “liquidation bankruptcy,” Chapter 7 bankruptcy allows the filer to discharge most if not all of his or her unsecured debt. Unsecured debt is that which is not directly related to property. You may also be able to eliminate some of your secured debt. Secured debt is that which is tied to property, such as a home mortgage or auto loan. If your home loan company is threatening foreclosure or your auto loan company is threatening repossession, you may be able to deal with these types of debt through Chapter 7 bankruptcy. Chapter 7 bankruptcy is usually cheaper than many other forms of bankruptcy because it is quicker and debts are handled in an easier manner. However, you likely must pay a $335 filing fee to the bankruptcy court as well as any other administrative fees that the court requires. There are exceptions to paying this fee, and if you qualify for a fee payment plan or waiver, then you may be able to reduce your costs or pay them over time. Your Chapter 7 bankruptcy attorney will also charge you fees, which likely must be paid before you file for bankruptcy. Attorney fees are dischargeable in a bankruptcy, so most lawyers want you to take care of their fees before you complete your bankruptcy. You should discuss attorney’s fees with your lawyer prior to filing bankruptcy. Most will provide this information during a free consultation. Generally, the Chapter 7 bankruptcy process can be completed in few short months. During this time, non-exempt assets will be liquidated and the proceeds will be used to repay your creditors. Any remaining unsecured debts will be discharged at the end of your bankruptcy, and you will have the chance to move forward with a clean slate. Request a free consultation with the Dallas Chapter 7 attorneys at our firm to find out more. Not everyone will qualify for Chapter 7 bankruptcy. A “means test” was introduced in order to ensure that those capable of paying back what they owe do so under the right bankruptcy chapter. The means test examines the applicant’s disposable income and measures his or her income against the median household income in the area. Request a free consult with the Dallas Chapter 7 attorneys at our firm to find out more. If you don’t qualify for Chapter 7 bankruptcy, you may be able to file a Chapter 13 bankruptcy. You don’t have to take a means test to qualify for Chapter 13, but you must have enough money to pay some of your debts. The bankruptcy court will evaluate your disposable income and you will have to come up with a payment plan that will allow you to repay some of your debts over three to five years. After you complete your payment plan, many of your debts can be discharged, or eliminated. Your attorney can help you with the necessary forms to file Chapter 7 bankruptcy. It’s important to include all of this information in the beginning, otherwise your bankruptcy case may be dismissed or delayed. After you file for bankruptcy, your bankruptcy trustee will set a date for a Meeting of Creditors. Although your attorney may represent you at most bankruptcy hearings, you will likely have to attend the 341 Meeting of creditors. In limited circumstances, you may be able to attend the meeting via phone. At the 341 Creditors’ Meeting, you and your attorney will appear along with your bankruptcy trustee. It will not take place in a courtroom. Instead, you will meet in a formal meeting room. Your creditors would be able to attend; however, very few creditors actually attend the Meeting of Creditors. If a creditor disputes your statements or has claims of fraud, then they may appear. Your Chapter 7 bankruptcy attorney can help you prepare for the Meeting of Creditors. What Happens to Your Property During Chapter 7 Bankruptcy? Chapter 7 bankruptcy is often called “liquidation bankruptcy” because people who file this type of bankruptcy often liquidate their property to repay creditors. While unsecured debts may be directly eliminated, you may be required to return property to creditors or liquidate and pay creditors for some secured debts. Your bankruptcy trustee would first determine which property is exempt and which is nonexempt, and you may be able to keep that which is exempt. Your nonexempt property is that which may be liquidated through Chapter 7 bankruptcy. Another situation that is common in Chapter 7 bankruptcy involves a creditor or trustee “abandoning” property. It may be too difficult for a creditor to participate in your Chapter 7 bankruptcy, so instead, they will abandon that property and the debt. In that situation, you will get to keep the property, even if it is nonexempt. You may still have to manage these nondischargeable debts after Chapter 7 bankruptcy. Your bankruptcy attorney can help you with debt management so that you don’t get back into a difficult situation financially. Call our team today to learn more about our services. Meet with us and take the first step in discovering whether or not Chapter 7 bankruptcy is the right course of action for you. 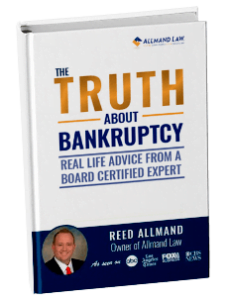 As the largest bankruptcy filing firm in the state, Allmand Law Firm, PLLC has already helped thousands of individuals find relief from their debt. Find out how we can do the same for you by contacting our Chapter 7 lawyers in Dallas for a free review. Your first consultation is free, so call our Dallas bankruptcy lawyers at (214) 884-4020 as soon as possible.